DO YOU BELIEVE IN ETERNAL VITAL UNION? I would dare say that there are probably very few people outside of the denomination known as Primitive Baptists who have ever heard any discussion of this particular doctrine. There are relatively few of them (PBs) who actually can explain it in any detail and they are generally known as Predestinarian Old School Baptists. I make no claims to being a scholar or expert on PB history nor is this article designed to define their history nor the theological positions held by various camps among them. 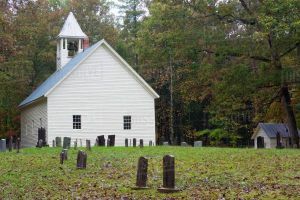 One of the first divisions that separated Baptists in general in this country was over the question of gospel means (i.e. ; whether or not the preaching of the gospel is the “means” GOD uses to quicken dead sinners) brought on by Andrew Fuller’s errors concerning the atonement. The subsequent introduction of various man-made institutions (such as mission boards and collections, Sunday schools, and the need for seminary training of those GOD had equipped and called to the ministry of the Word) was the straw that broke the camel’s back. The Black Rock Address defined the grievances and errors which those who came to be called Old School Baptists saw as insurmountable errors and there came about a separation along those lines that still exists today. Amazingly there are factions among the “Primitive Baptists” who originally separated themselves from the “Missionary Baptists” who have in great measure adopted many of the practices (if not the theology) of those from whom they separated themselves. Those who would ultimately be called “Conditionalists” or “Limited Predestinarians” and those who would be called “Predestinarians” or “Absolutists” are generally divided over this particular issue of EVU. Many of those who claim to be “Absolutists” contend that one must hold and articulate this particular doctrine to be numbered as a genuine Predestinarian Old School Baptist. Since I make no claims to being a Primitive Baptist I cannot comment on the accuracy of this contention but I can definitely say that a man can believe in a Sovereign GOD who absolutely predestines all things and not hold to the doctrine of EVU as it is articulated by those who are fond of that doctrinal terminology and see it as the basis upon which the gospel rests. In some ways my inability grieves me because I have the utmost love and respect unto some who believe that this particular doctrine forms the very basis of the whole gospel. If I believed it to be true according to the scripture record then I would no doubt hold the same position, so I do not fault them for their stand even though I cannot agree with them. I am going to attempt to define the doctrine of EVU (as I understand it) and then to state my objections to it. In doing so let me say at the outset that I have no desire to misrepresent the doctrine of EVU nor to produce a straw man which can be easily slain, as some of the opponents of it in times past seemed intent on doing. Unless we are trying to sway others to our way of thinking, nothing can be gained by a willful misrepresentation of another’s views on a matter so I stand to be corrected if I do misrepresent it in any way. The only definition that I can give of it is as what the proponents of EVU “appear to me” to be saying. Often our misunderstandings of the positions of others hinge in great measure on semantics and usages of similar terms which mean totally different things to those who may hold the other view. I hope to avoid that if possible. Now as I look at these terms I do not in essence completely reject them all, but as I believe them (EVU’s proponents) to understand them I cannot agree with their conclusions. I will start off by a discussion of each term and how I see them to have a basis in truth yet ultimately swerve from the truth as I understand it. At the outset let me reiterate that we all see through a glass darkly on such matters as these so we do not profess to set forth some high scholarly work which will serve as the definitive truth in these matters from this time forth. This is merely an explanation of my own views as I see them at odds with the teaching of EVU. Eternity in the scripture appears to me to be the sole habitation of GOD. IT is that which separates HIM from all that HE has created. HE said HIS name is HOLY, which means separate, which is where we get the concept of sanctification, or being set apart. HE is not duplicated in any of HIS creation and is totally separate from it even though HE has seen fit to create man in HIS own “image”. This is where the wonder of the incarnation of JESUS CHRIST springs. How can it be that HE who is ETERNAL could make HIMSELF of no reputation and take on the very nature of a man? Amazing to say the least, how can it be? I cannot tell except to say I believe it. It is upon this very point that my initial rejection of EVU begins to appear. Those who believe it, take the scriptural phrase “before the foundation of the world” to be equal with GOD’s existence. In other words, they would say that when the scripture says “before the foundation of the world” it is speaking of Eternity. Some use the term eternity past but it is clear that eternity can have no past present or future. This is merely the attempt to comprehend the incomprehensible by using a time frame in which to put it. But the phrase “before the foundation of the world” cannot in any wise be shown from the scripture to be a definition of “eternity” and most assuredly does not necessarily encompass the eternal nature of GOD who “alone has immortality”, nor can it be shown to be descriptive of the totality of HIS existence. None of us can know (the secret things belong to GOD) all of the things that GOD has done or what other worlds HE may have created before HE created this one. We can only know what HE has seen fit to show us. I am not suggesting that HE has created other worlds, because we have no way of knowing. I am saying that “before the foundation of the world” is only a reference to a time frame so that we as finite beings can comprehend when GOD chose those people which are said to be “in CHRIST”. It is a reference to a time before even the first molecule of creation as we see it was formed, it is not a reference to the eternity which GOD alone inhabits. Now some would perhaps say “what is the import of this definition?”. Those who teach EVU are fond of saying that the existence of the elect is as ancient as GOD HIMSELF. I reject this notion on the grounds that NOTHING can be said to be as eternal as GOD HIMSELF for the scripture plainly says that “HE is before all things”. (Col.1:17) HE is the BEGINNING and the END. Such a notion in my own understanding, besides being based on an unscriptural definition of Eternity would cause the election of GOD’s people to be no more a choice of HIS than HIS SON was HIS by choice. We are quite sure that the SON of GOD is ETERNAL and is of the same existence as HIS FATHER and the HOLY GHOST and none of them are such because they were chosen by the other, but they are all self existent and ONE GOD. To contend that the sons of GOD are co-eternal with the only BEGOTTEN SON of GOD is to negate the necessity of election and eliminate the manifestation of grace in salvation; making it more a matter of necessity or obligation than a demonstration of grace. There are other aspects of this “eternal existence” which we could object to, but in the interest of brevity we will move on to the other terms. The word ‘Vital” is not objected to in any wise because of the SOURCE from which it is said to come. We quite surely agree that all life springs from HIM in whom we live and move and have our being, most assuredly that “eternal life” which HE has promised and bestowed on HIS children. The point as to when the individual sons of GOD are said to possess this life is what is in question. Those who contend for EVU seem to be of the opinion that this life was their possession from all eternity even as CHRIST HIMSELF has possessed it, so they as the eternal sons of GOD, (though in “seed substance”, nonetheless a real existence) have it in their position in HIM, even before they have a body created for them. Part of our objection to this concept appears in our comments on “Eternal”, but is not restricted to that because it also appears to us that if the sons of GOD are said to have possessed eternal life as long as CHRIST it would run contrary to Paul’s declaration, “You hath HE quickened which were dead in trespasses and sins.” It appears that Paul is describing a giving of life or a bestowal of life to those who heretofore did not possess it. Now according to the consideration that those who hold EVU this could not be a reference to the natural man because he is never quickened (and we agree) so it would appear that a new gift of life is in consideration. Something that has “eternal life” cannot be considered to be dead at the same time, it does not appear to us. This work of GOD in HIS people is described again by Paul when HE said, “Therefore if any man be in Christ, he is a new creature: old things are passed away; behold, all things are become new.” (2Cor 5:17) EVU proponents are fond of the verse which says, “And this is the record, that God hath given to us eternal life, and this life is in his Son.” (1John 5:11) We are quite fond of it ourselves but see no connection to anything that has occurred before the new birth except as all of GOD’s purpose has existed in HIS decrees which are indeed part and parcel of HIS being as GOD and can in no wise be overturned. We however were personally and individually strangers to the life of GOD as it is in CHRIST JESUS until such time as HE saw fit to bestow it on us when HE turned us from darkness to light. The “Union” which we are said to have in CHRIST is another area where I have a divergence of opinion with the Doctrine of EVU. We do believe that there is a unity which CHRIST has had with HIS people ever since they were given to HIM before the foundation of the world. This union forms the very basis of HIS ability to be our REDEEMER and the legal grounds upon which imputation takes place. When the angel appeared to Joseph and said, “HE shall save HIS people from their sins.” (Mat.1:21) he was referring to this “union”. The LORD laid down HIS life for those who were united to HIM in the covenant of redemption which HE gladly entered into in their behalf. It is here in a consideration of this union that there is some considerable fogginess in how this union actually exists according to the claims of EVU’s various proponents. Most will not come right out and say that they believe the elect are GOD but yet they will quote John 10:34 and speak about how the scripture applies terms of deity to them as if to approach unto saying that. Their insistence on the “eternal” nature of this union and the mutually complete (or symbiotic) relationship (as they see it) between the HEAD (CHRIST) and HIS body (the church) gives us an uneasy feeling and seems to blur the lines between the CREATOR and HIS creation even though we are quite sure that CHRIST has according to HIS own will and purpose loved HIS people before the foundation of the world and they are said to be chosen in HIM. Perhaps the greatest single area of disagreement that I have with the doctrine of EVU is in how it would purport that the scripture uses the terms “old man” and “new man”. It seems perfectly acceptable to its proponents to totally disregard how these terms are used in the scripture. The term “new man” appears only two times in the scripture (in any context which could possibly have reference to their use of the term) and the term “old man” appears three times. EVU purports that the “new man” is this “new creature” which has come down from heaven to be implanted in the bodies which the elect have been given to occupy. Now this body is the tabernacle in which this “new man” supposedly takes up his abode alongside the “old man” who also lives there at the same time. The “new man” is the developed “seed substance” which is now made manifest. This “new man”, in addition to being eternal, is without sin and incapable of sinning and never needed redemption. The whole basis for this concept (as far as I can tell) is built on a faulty interpretation (IMHO) of verses in I John. “Whosoever is born of God doth not commit sin; for his seed remaineth in him: and he cannot sin, because he is born of God.” (1John 3:9) “ We know that whosoever is born of God sinneth not; but he that is begotten of God keepeth himself, and that wicked one toucheth him not.” (1John 5:18) If one totally disregards the context in which John writes it would still be a stretch of the imagination to consider that John is speaking about a “part” of a man which does not sin. Paul seems to be totally unaware of such a “person” in his own experience and writing. John is clearly (IMHO) describing the fact that those who are born of GOD are not habitual transgressors or those who have no regard to the law of GOD. He had already pointed out that any man who said he had no sin was a liar, yet we are supposed to believe that he has shifted gears and is now talking about some “creature” which is not sinning at all but merely occupying the same space as the one who is a “sinner”. It baffles me as to the penchant of men, who, otherwise, are sticklers for using bible terms biblically can so easily depart from that conviction in this particular matter. At the same time I am amused when they consider that anyone, who refuses to use their chosen terms to describe the conflict between the SPIRIT and the flesh, is somehow denying that sin yet remains in its most virulent form in these same men who have been born again by the SPIRIT of GOD, or that there is not a life and death struggle taking place in them. The proponents of EVU speak of the “new man” putting off the “old man” as if this is a current occurrence yet the scripture clearly says that this has already taken place, “Lie not one to another, seeing that ye have put off the old man with his deeds; And have put on the new man, which is renewed in knowledge after the image of him that created him.” (Col 3:9-10) (see also Eph.4:20-24) Paul even says that the “old man” is crucified with CHRIST. I have written more extensively on the scriptural use of the terms “old man” and “new man” in other articles and will not go into that here, except to state that the “old man” (scripturally) is that man we were before the new birth, totally dominated by sin. The “new man” is that man we are now after the new birth, still plagued by the same sinful flesh in which we were born, but no longer completely dominated by that sin. “Being then made free from sin, ye became the servants of righteousness.” (Rom 6:18) We are now “new creatures”, those which did not exist before we were born from above by the operation of the SPIRIT of GOD. My intention in writing this article is not primarily to criticize those who hold tightly to the doctrine of EVU nor in any way to try to undermine their influence. Neither do I entertain the slightest notion that what I have written will cause any of them to change their minds on the matter. I am merely stating why I cannot in good conscience embrace this doctrine in its totality. Perhaps my conclusions as to what EVU is teaching are completely off base. If so it would be my desire that those who are its proponents would (gently I hope) point out my misconceptions of their teaching and show me from the scriptures where my thinking is in error. If I have been offensive in my descriptions or rough use of language I would apologize but make no apologies whatever for any offense taken or given by trying to present what I believe the scriptures to confirm and/or oppose. Some of EVU’s proponents have suggested that to publicly discuss and question this doctrine is to risk wounding the tender conscience and mind of some of GOD’s little children by causing them to question this doctrine which is purportedly the basis of their comfort and hope. It is for this very reason that I would contend that this subject should be examined. It appears to me that the basis upon which the comfort and hope of the sons of GOD must clearly rest is the finished work of redemption which has been undertaken and completed by the LORD JESUS CHRIST. That redemptive work is without doubt useless to consider unless one is aware as to who it was that this work was performed for. We are certain that CHRIST came into the world to “save HIS people from their sins” as the angel told Joseph. HE has accomplished the work that HE intended to perform and shall return at the appointed time to claim HIS purchased possession. As glorious as the doctrine of unconditional election is, election is not our salvation. Neither is that union which we have been given with HIM in that covenant of redemption, the carrying out of our salvation. The actual redemptive work of CHRIST must be the very grounds of our confidence before GOD which is why Paul said, “GOD forbid that I should glory, save (i.e. ; except) in the cross of our LORD JESUS CHRIST.” It is probably impossible that we should fully ascertain the existence of our name in the LAMB’s book of life while we are in this world, but by the grace of GOD we have been given a hope in the atoning work of CHRIST, whom we are convinced came into the world to save sinners. On that basis and grounds our hope is built, and we dare not trust the sweetest frame of anything besides. The lines between the ETERNAL GOD and HIS creation are blurred. The scriptural uses of the terms “old man” and “new man” are completely ignored. May the LORD be pleased to give us more light, lead us by HIS grace, and cause us to seek nothing more or less than the glory of JESUS CHRIST our LORD.